With Pallet Live Storage (or PLS), pallets are stored on inclined tracks with rollers or wheels. As a pallet is removed, the one behind it in the racking rolls gently into place. 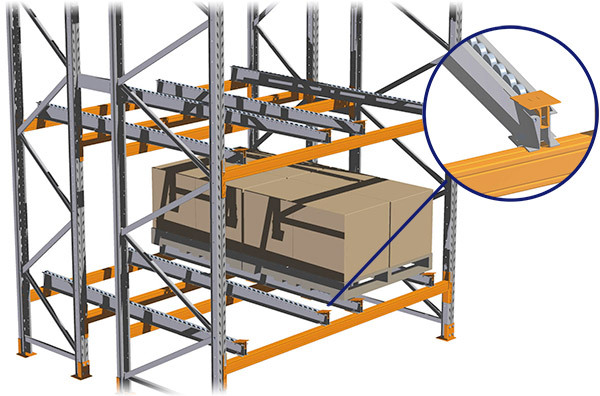 In Pallet Live Storage (PLS), pallets are stored on inclined tracks with rollers or wheels. As a pallet is removed, the one behind it in the racking rolls gently into its place, providing automatic stock rotation. Using the first in, first out (FIFO) principle, PLS allows faster handling and simplified pallet selection. Replenishment occurs at the back of the system, allowing safe pedestrian access to stock whilst forklift operators continue in the next aisle, providing great OH&S benefits. As with any high-density storage system, long lane PLS can be a great solution for chilled or freezer environments, and can even reduce energy costs as lighting is only needed at the front and back of the rack. Why ColbyRACK Pallet Live Storage? Designed by leading Colby's leading Australian structural engineers, Colby Pallet Racking is designed to ensure safety, integrity, and compliance, meeting rigorous international structural standards.